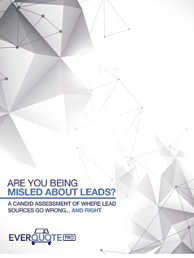 Are You Being Misled About Insurance Leads? Lead providers. Marketplaces. Which is the best source for your insurance leads? Find out the pros and cons of using both options—and learn which is the right choice for you. The pros and cons of buying online insurance leads. The difference between a "lead provider" and a "Marketplace." Why you’ve been burned buying leads in the past—and what you can do so it won’t happen again!